Nestled between the picturesque villages of Old Warden and Cardington, vines were first planted on this beautiful Bedfordshire field in medieval times by monks at the Cistercian Abbey of Warden. 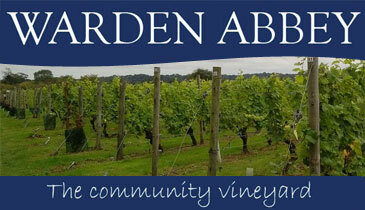 Replanted in 1986, the vineyard is now run by Bedfordshire Rural Communities Charity as a community project and social enterprise. The four acre vineyard relies totally on its volunteers, who are involved in all aspects of its running, care, and wider development. The project works with other local charities and schools to provide a unique setting for learning and skills projects, including help for people into employment or voluntary work, social and therapeutic horticulture, wildlife and heritage projects. The wines have won awards at national and international level. Open for tours (advance booking required) May to Sept. Also popular September open day with local stalls, childrens activities, BBQ, pop up wine school, history talks and tours.